The Dobell Festival of Art and Craft will return for it's 43rd year in 2019.. The 2018 Festival attracted over 300 original works of Art and hundreds of high quality hand-made Craft items. Wangi Lions Club is confident 2019 will again be a record year for quantity and quality of local art and craft. The 2019 Art Prize will be judged by Dr Margaret McBride a prominant Newcastle exhibiting artist, art historian, curator and art teacher. Entry forms can be downloaded from links at the bottom of this page. The Dobell Prize for 2018 was awarded to John Edge for his oil painting 'Still Life'. 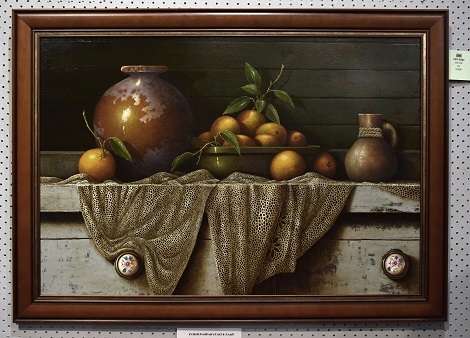 The 2018 judge of the art section, Brad Franks said Edges' painting "took a traditional subject and gave it an astonishing treatment". 11-19 Market St. Wangi Wangi NSW.